Mindo is a paradise that invites you to visit and enjoy its natural attractions, hidden in clouds, mountains and lush vegetation. 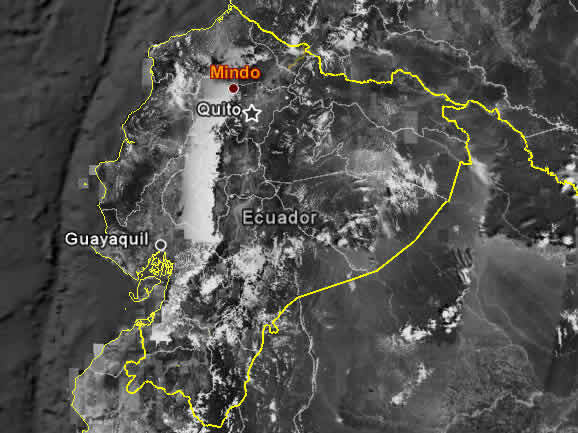 We leave in the morning from Quito, then drive the old road to the coast, towards Mindo. This street is famous for its beautiful scenery and for being one of the best birding areas of Ecuador. Approximately 500 species of birds can be found in this cloud forest. The area has subtropical rain forests, primary and secondary with heights ranging between 1600 and 4780 meters over sea level. Once in Mindo we transfer to cross the cable car, located at 530 meters, then take the tour to visit the waterfalls located at a different time of approximately 5 to 10 minutes of one another and offer many opportunities for sports water. Continuing our tour we return to town and enjoy a delicious lunch. Afternoon visit the Butterfly Garden where we will observe the process of metamorphosis and then makes a caterpillar turn into butterfly. The Butterfly can observe 25 varieties of butterflies flying in a greenhouse of 644m ². Ecuador is one of the countries with the highest diversity of butterflies. Ecuador is the exhibition with more species and greater number of individuals flying in their facilities. Based on the investigations has identified over 40 species, but not all can be reproduced in captivity. After enjoying a wonderful day, return to the city of Quito. Warm clothes, hats, gloves, scarf, sunscreen, walking shoes, sunglasses, camera (wide angle lens) and binoculars.